Click images on right to enlarge. Billy Graham has appeared 55 times in the Gallup Polls annual survey of The Most Admired Men in the World. Gallup reports: The Reverend Billy Graham has been in the top ten more than any other man55 times since 1955. He has finished as high as second place, which he has done on eight occasions. After Graham, Ronald Reagan is next with 31 top ten finishes, while Pope John Paul II, Jimmy Carter, Eisenhower, Richard Nixon, Harry Truman, and Bill Clinton have had twenty or more. 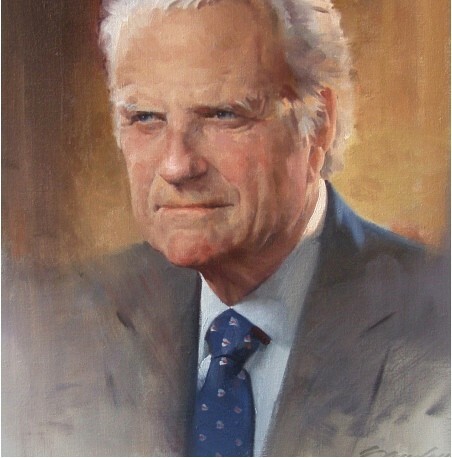 The most recent poll (2011) has Billy Graham in fourth place among the World's Most Admired Men. ugust 29, 2012, was a gloriously beautiful day in the Blue Ridge Mountains of western North Carolina. I had given a lecture the evening before in Linville, a beautiful and popular resort town. It was high noon, and Elizabeth and I were now driving on the Blue Ridge Parkway southwest to Black Mountain. Just north of Black Mountain is the miniscule village of Montreatlong a popular Presbyterian summer conference center. After meeting our host, the Reverend David Bruce, who serves as executive assistant to Billy Graham, we entered through an extraordinary series of security gates and made the long winding drive to the top of the mountain. There we parked the car before the low, rambling, modest log cabin that has been where Billy Graham lived for all of the 64 years of his marriage to Ruth Bell Graham, and where he now lives without her, surrounded by an alert, helpful and loving staff. The great man awaited us in his book-and-memorabilia-filled study. We knew that his 93 years were weighing heavily upon himthat he walked only with the greatest of difficulty and that his eyesight and hearing were less than perfect. When we entered the study, he was seated in a chair by the windows, wearing a pale blue open collared shirt, a navy blue sweater, and casual denim slacks appropriate to the country setting. 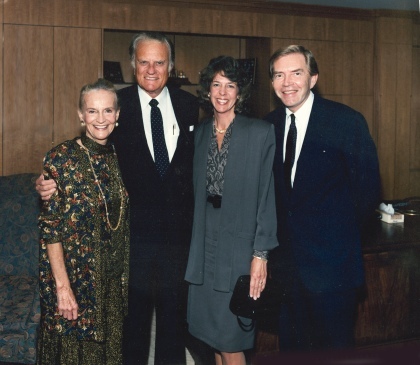 As we entered the room, Billy Graham greeted us with a warm smile and a gracious greeting. I had brought with me a framed copy of my recent White House portrait of Billy's friend, President George W. Bush. I had inscribed the print to Billy and I now presented it to him. He received it warmly and studied it with great interest. I was carrying a portfolio containing a number of large mounted prints of photographs from the past that I expected would interest Billy. First, I showed him a print of himself with my father taken in 1948 in Minneapolis, when Billy Graham, then thirty years old, was president of the Northwestern schools (later Northwestern College). 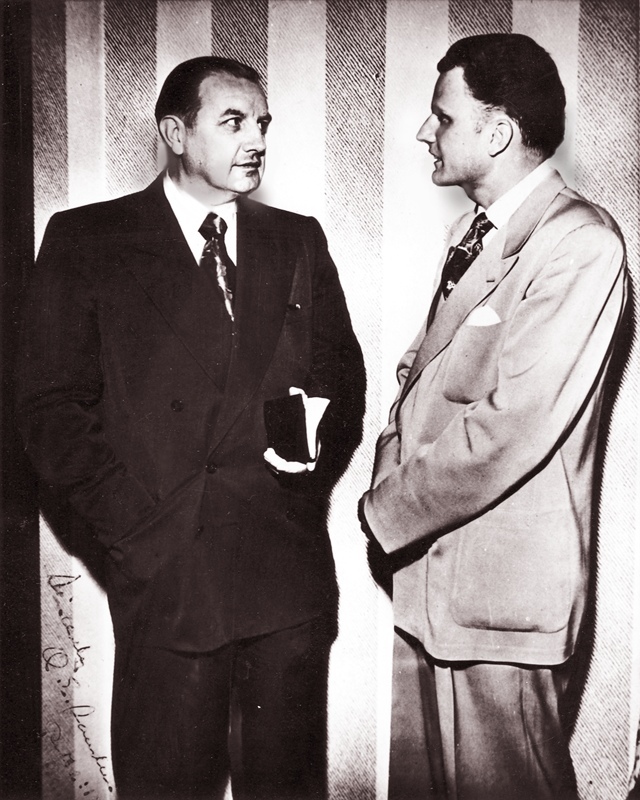 My father, Reverend Oscar E. Sanden, had been Dean of the College of Liberal Arts at Northwestern, and so had served with Billy at that school throughout the five years that Billy was its president. Billy spoke very warmly of my father. 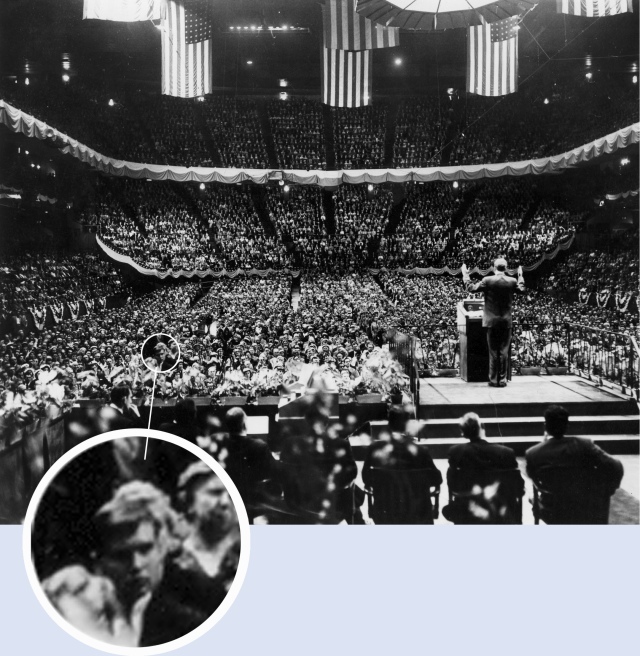 Next I showed him a photograph taken in Madison Square Garden, New York, on Sunday afternoon, May 15th, 1957the opening service of the Billy Graham New York Crusade, which packed the Garden every night for sixteen consecutive weeks, setting a never-to-be-broken attendance record for that venue. The photograph which I showed him of the opening service had appeared on the front page of The New York Times the day following, and was a view of the vast crowd of some 16,000 people attending the meeting. I had blown up a section of the lower left corner of the picture in which you can very clearly see the face of a very young John Howard Sanden sitting in the front row. Thus we continued on for the next few minutes, enjoying these reminders of great days from the past. Billy was quick to provide specific details from his vast memory. Again and again, the famous man exhibited a trait for which he is known and admired around the world: he is extraordinarily modest, always quick to credit God for the vast accomplishments with which Billy Graham's name is associated. In his sixty years of globetrotting ministry, in which he appeared and spoke face-to-face with more than 220 million people on every continenta record which will surely never be surpassedhe almost makes it seem as if he were a bystander, observing the mighty hand of God at work. We were reluctant to leave, but we knew we must. With Elizabeth on his right, and me on his left, he held our hands firmly and strongly while photographs were made. We said goodbye. As I looked back from the door, there was a warm smile on that famous and classical face. In 1993 Billy Graham gave me two sittings in my New York studio, and a third in his office in North Carolina. At the beginning of each sittingas we stood alone together in the studiohe offered a simple and beautiful prayer. 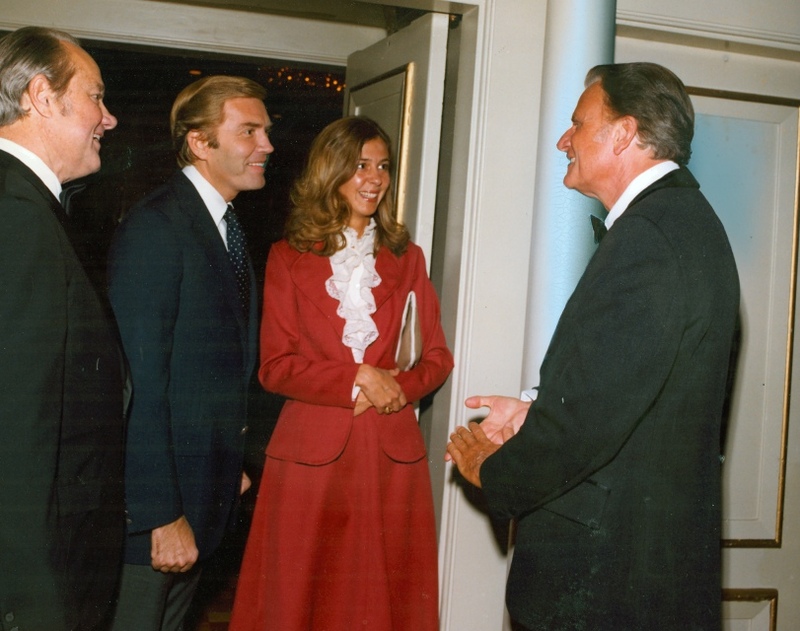 At the conclusion of the last sitting, Mrs. Graham invited me to the Graham's mountaintop home for lunch we sat in the kitchen around a big round table and ate delicious Italian spaghetti. But before the meal, Billy Graham asked me to pray! Quite an experience for a portrait painter. 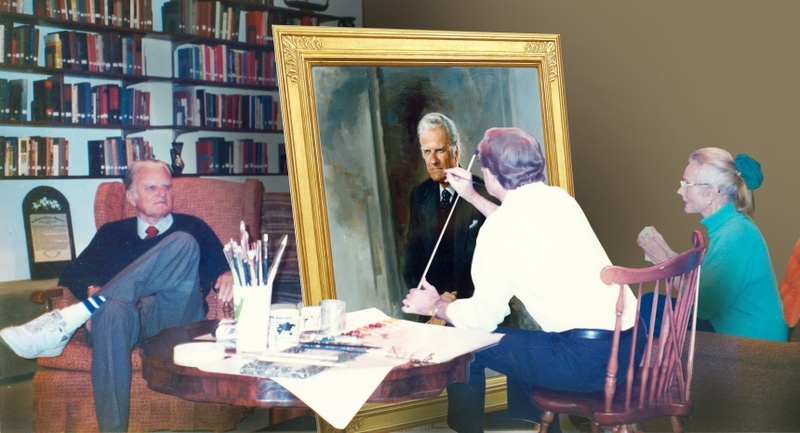 From these sittings I produced the three-quarter length portrait which hangs at the Billy Graham Training Center just outside Asheville, North Carolina. 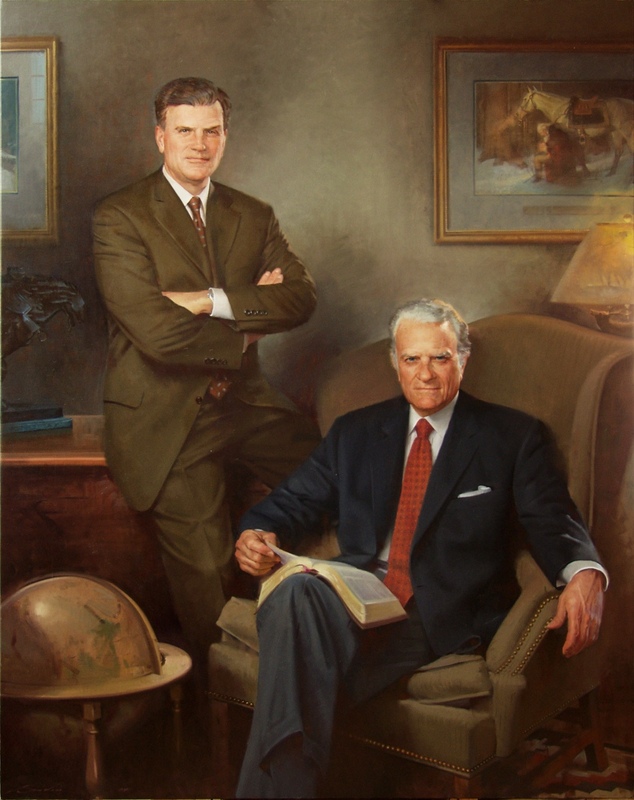 In 2004, Billys son Franklinalso a famed evangelist with a worldwide ministryinvited me to create a double portrait of him and his father together to hang in their new world headquarters in Charlotte, North Carolina. Franklin sat for me in his office in Boone, North Carolina, and for the figure of the senior Dr. Graham. 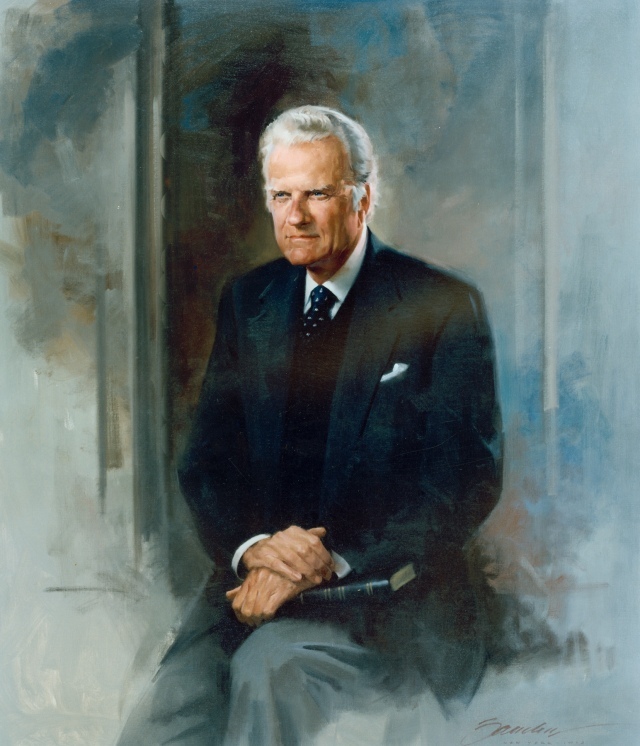 It was decided that I should use the extra reference material from the 1993 sittings in New York to create the likeness of Billy Graham. Oil on canvas, 50 x 42 inches. Oil on canvas, 28 x 22 inches. Rev. T. W. Wilson in New York. Billy Graham sits for me at Montreat, North Carolina, as Ruth Bell Graham looks on. Oil on canvas, 72 x 56 inches.